That's bad for the forest products industry and jobs as Maine's biomass power sector continues its struggle to become profitable. Two troubled Maine power plants that make electricity from wood have produced no power in the past four months, a financial hit to their owner, Stored Solar LLC, and an unwelcome development for the forest products industry. 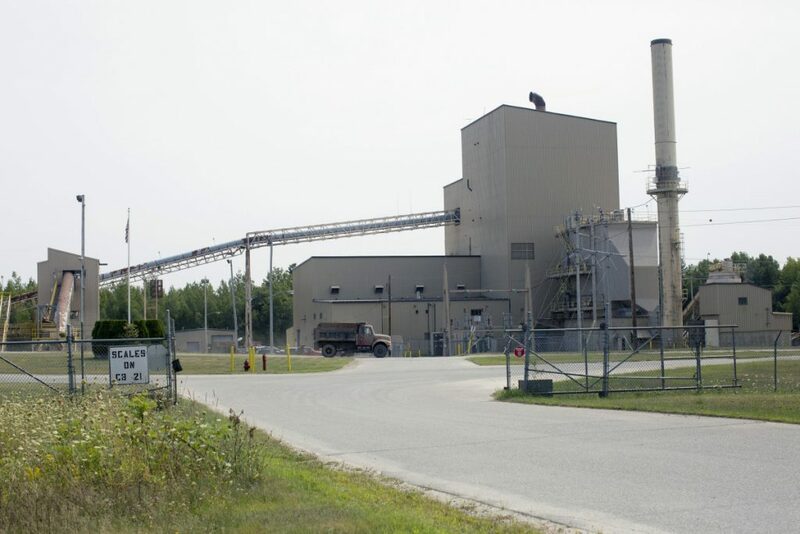 A quarterly performance report filed this week with the Maine Public Utilities Commission shows that the plants in West Enfield and Jonesboro were essentially off line in April, May and June of this year. During that period, the report showed, they purchased only a small fraction of the wood fuel that they had promised to buy, and also had significantly cut their workforces. The plants remained off line in July, too, Stored Solar said, and won’t restart until fall at the earliest. The news comes less than four months after the PUC voted to give Stored Solar $1.2 million, a portion of a controversial state subsidy meant to keep the two stand-alone biomass power plants alive, as well as the jobs linked to them. But in a response Tuesday to questions from the Portland Press Herald, one of the principals in the company, Fahim Samaha, said low wholesale electricity prices and values for renewable energy credits in New England have made operating the plants uneconomical at this time, even with the state subsidy. “The purpose is to have a healthy operation and not burn taxpayers’ money in the boilers, just for the sake of benefiting from a subsidy,” he said. Samaha said the company has instead chosen to perform a second phase of boiler upgrades aimed at making them more reliable and efficient. Stored Solar plans to resume operation this fall and winter, he said. Maine’s biomass power plants use leftover wood from forestry operations and sawdust from lumber mills to make electricity. They’re a crucial outlet for low-grade fiber and a source of employment for hundreds of logging contractors and truckers in rural areas where paper mills have closed. Despite cutbacks, Maine’s logging industry contributes $882 million annually to the economy and supports more than 7,300 direct and indirect jobs, according to the Professional Logging Contractors of Maine. As a general rule, Doran said, each megawatt of generating capacity requires four workers to harvest and haul wood and one worker to help run the plant. The Stored Solar plants are each rated at 24 megawatts, which translates into 240 potential jobs. 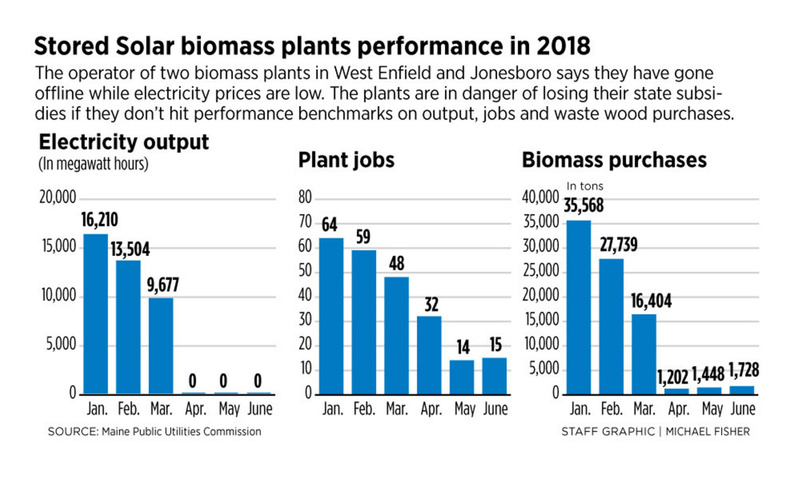 One potential solution to enhance the economics of biomass plants is to site other businesses nearby that can use electricity or the waste heat emitted by the plants, a strategy called co-location. Last November, Stored Solar received approval of a $500,000 state-backed loan to help build three shrimp farms in West Enfield. Samaha said Tuesday that site clearing and preparation for the Kathadin Shrimp Farm is under way and agreements are being finalized with the co-location company. The actual status of the project is unclear, however. According to the Finance Authority of Maine, Katahdin Shrimp Farm has not fulfilled all of the lending preconditions and the loan has not closed. The loan was approved by the Maine Rural Development Authority. Stored Solar’s failure to run this spring and summer was tempered somewhat last week by news concerning two biomass plants in Aroostook County owned by ReEnergy Holdings. ReEnergy announced that Emera Maine, the area power utility, is seeking approval from federal energy regulators to reduce the cost of transmitting power through Canada to the New England electric grid. That could improve the economics of the company’s plants in Ashland and Fort Fairfield, in extreme northern Maine. But in its news release, ReEnergy also noted that the Fort Fairfield plant needs a new power sales contract to remain viable, and could shut down in October without one. A process aimed at finding a new agreement is currently underway at the PUC, but the company said it will start cutting back on wood-fuel deliveries in early August, in anticipation of a potential shutdown. ReEnergy also owns biomass plants in Livermore Falls and Stratton. It has been working with the Biobased Maine sustainable-manufacturing advocacy group to negotiate with companies interested in co-location. ReEnergy said that could create additional jobs and would be critical to the financial health of the plants. Details, however, will depend on the size of a co-location project and whether the plants can keep operating while the project is developed, a process that could take two or more years. ReEnergy and Stored Solar are the beneficiaries of a two-year bailout from the Legislature meant to be a temporary bridge to give plant owners time to diversify. Stored Solar has conveyed a vision of transforming West Enfield and Jonesboro into combined heat and power facilities that won’t need government support. The shrimp farm is meant to be a first step toward that goal. Meanwhile, the state subsidy is providing a lifeline to the biomass plants. To receive the subsidy, the plants need to operate at 50 percent capacity or greater. For the first half of 2018, Stored Solar’s plants are averaging 35 percent, according to the PUC. Last year, Stored Solar was supposed to buy 500,000 tons of low-grade wood from logging contractors, maintain more than 40 jobs and invest $2.5 million in the two plants. The PUC found the company largely met the jobs goal, but bought only 40 percent of the wood and invested only 60 percent of the required money. Based on that, the subsidy was trimmed in April to a quarter of what was possible, roughly $1.2 million. For 2018, Stored Solar will face steep challenges to receive some of the subsidy. The PUC’s report found that over the winter, the plants generated a total of 39,391 megawatt hours, employed 57 people and bought 78,711 tons of wood fuel. But during the spring, power output fell to zero, employment dropped to an average of 20 and fuel purchasing plummeted to 4,379 tons. It remains to be seen whether Stored Solar can meet its obligations, as Samaha has made overly optimistic statements about the company’s plans in the past. In April, he told the Press Herald that the plants were in a planned shutdown because an early mud season had made timber harvesting difficult, and because demand for electricity had tapered off with mild weather. They would ramp up again in a couple of months, he said at the time, along with timber harvesting activity, to deliver fuel for high summer power demand in New England. The uncertainty doesn’t surprise Eric Kingsley, vice president of Innovative Natural Resource Solutions, a forestry consulting firm in Portland. He predicted last spring that Stored Solar’s subsidy arrangement would be insufficient to make the plant’s profitable. The key, he said, is for these plants to finally find co-location partners.